To provide access to the arts and arts education for the entire community. Generation NEXT removes barrier to arts participation by providing a diverse range of free cultural, educational and artistic experiences to more than 60,000 annually. Reach students in ways that they are not otherwise being reached. Connect students to themselves and each other. Transform the environment for learning. Provide learning opportunities for the adults in the lives of young people. Provide new challenges for those students already considered successful. Connect learning experience to the real world. In partnership with Tobin Center Resident Companies, The Tobin Center showcases classical music and literature based performances for elementary through high school students from all nineteen (19) local school districts. Popular touring shows and award winning national touring theater companies that introduce families to the performing arts. Lectures, master classes, theater workshops, in-school performances, and audience talk backs are presented for students and audiences from all socio-economic backgrounds. Matinee performances for individuals diagnosed with an autism disorder or other sensory sensitivity in an environment that suits their specific needs. Engagement programs for everyone including an annual open house, pop-up performances, performance simulcasts on the Will Naylor Smith Plaza, H-E-B Cinema on the Plaza, and University Health System Fitness on the Plaza. The Tobin Center provides professional training for classroom teachers on integrating the arts into curriculum areas as an approach to teaching core subjects. In this way, the arts leverage learning in other STEM Subject areas including student success, engagement, and test scores. Donate Now - The Tobin Center is a 501(c)(3) not-for-profit-organization. Charitable donations, from loyal donors and arts advocates like you, help The Tobin Center enrich, inspire and fuel the San Antonio community through diverse programming and free and accessible events. Join us in our mission to provide access to the arts and arts education to the entire community by making a gift today. Text to Donate - Text Kids to 210-879-8605 to donate now from your mobile device. 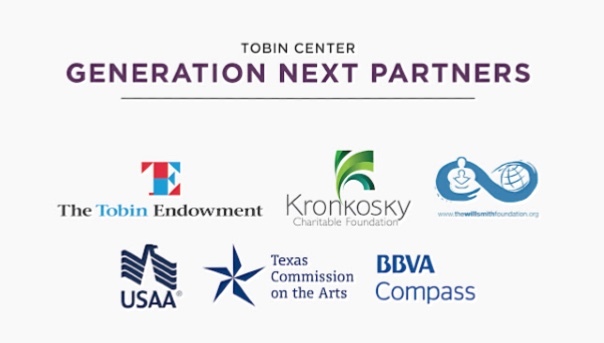 The Tobin Center's Gala - An annual event benefiting The Tobin Center's Generation NEXT Education Initiative, with a mission to provide access to the arts for the entire community. Please join us for our Gala on October 24th, featuring a performance by Gladys Knight! Shop & Share for a Cause - Remember to use Amazon Smile this holiday season (and all year, too) when shopping online and be sure to share the site with friends and family, too. You'll find the exact same low prices, vast selection and convenient shopping experience as Amazon.com with the added bonus that Amazon will donate a portion of the purchase price in your honor to The Tobin Center for the Performing Arts when you select us as your charity of choice. Select Bexar County Performing Arts Center Foundation to give to The Tobin Center. Introduce youth to all genres of the performing arts. Provide access to the performing arts to those who could not otherwise attend. Support arts education through performances that inspire, enrich and educate youth. Present professional development for classroom teachers on integrating the arts into STEM curriculum areas, increasing student understanding, engagement, and success.